Every day on my way to work I had to pass the Protein Man, Stanley Green. Remember him? He used to walk up and down London’s Oxford Street booming out in a sonorous voice ‘Buy my book’, and carried a sign proclaiming the dangers of proteins, saying that they caused lust. His solution was “protein wisdom,” a low-protein diet for “better, kinder, happier people’, and he’d sell you a 14-page booklet on the subject. He was very pleasant, and police and public were generally tolerant of his odd ways. He carried on being a human billboard for 25 years. When he died in 1993 at the age of 78, The Daily Telegraph, The Guardian, and The Times all published his obituary, and his pamphlets, placards and letters were passed to the Museum of London. I liked the way ‘And Sitting’ was added to the bottom of his ‘Do Not’ list on a separate little board. Now Oxford Street only has the singing, dancing Krishnas to brighten it up, as the irritating shouty-megaphone-God bloke who used to stand at Oxford Circus has also vanished. London always had a tolerance for eccentrics, but we see less of them now. The mad, it seems, are always with us. Right now, a rapidly increasing stream of New Age believers – or esoterics, as locals call them – have descended in their camper vans on the picturesque Pyrenean village of Bugarach, thirty miles from Perpignon. 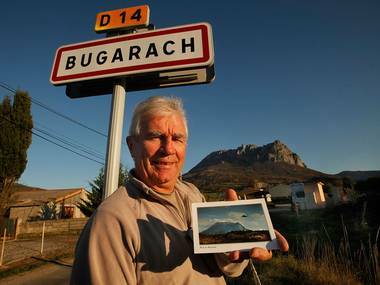 They believe that when apocalypse strikes on 21 December this year, the aliens waiting in their spacecraft inside Pic de Bugarach will save all the humans near by and beam them off to the next age. According to eschatological beliefs and predicted astrological alignments, the world-end comes after a 5,125-year cycle in the Mesoamerican Long Count calendar, and the so-called ‘Upside Down’ mountain hides a space ship. 100,000 people are expected by December, and US travel agents are offering one-way deals there. Needless to say, the French locals are hiking up prices and reaping fortunes from the credulous. I’ve got my eye on tickets for the after-party. These are the Soylent Green people: always looking at the back of their hand for their personal expiration date. not finding it, and then seeking a mass expiration, or exit date, for the lot of us. Well, give our sun and the black hole at the center of our universe enough time… Can’t wait that long? The Perpignon looks a lot like Ayers Rock in a bad light to me. Have these New Age folk driven over and checked out the site to make certain a group of Aussies aren’t back there building a really big Downunder theme park? P.S. Dan, you’re actually thinking of Logan’s Run, rather than Soylent Green, but, yeah, every generation seems to suffer from the hubris of thinking that the world ends with them, and heat death will claim us all in the end (unless there’s a way to go trans-dimensional…). My Granda Bill knew him. I don’t know how well, but enough that they knew one another by name. They blathered on about gardening from what I dimly recall. Funny folk, these end of the worlders. When that American preacher told us that the end of the world was nigh last year, some of his followers gave all their money to charity. A strange thing to do. Unless the charities were somehow immune to the rapture and would carry on rescuing donkeys in the afterlife. Larryy: Thanks. You are of course right. For a really long time there was a tall blind man dressed as a Viking, or Thor, with spear, helmut, often a shield, boots and what have you in New York City. He stood on corners and hummed or spoke out, his name was Moondog and he wrote music and invented musical instruments. He recorded many songs and a number of albums. Eventually. he moved to Germany where he lived and recorded some more. There may be a website up. I met him once at a crossing and my father introduced me to him. He said to me: “You got to go to Germany, go abroad.” Something like that. Well, I did and I married a German, and I write stories pieces set mostly in Germany. Frankly, I’d forgotten about him, until this post. This is an involving blog isn’t it. I can confirm the existence among London students of badges that just said “more protein”. Your fellow at least gave good advice, Dan. Apocalypse? I prefer the Apocalypso – the end of the world, but with a catchy beat! There’s a local councillor on Whitby Council who has recently revealed that his mother was an alien, and that he himself was kidnapped by the aliens when a child ………Whitby, of course, has strong links to Count Dracula.